Residents of Skelmersdale, Lancashire, were thrilled to learn via The Pope's Twitter page that he intends to visit the town in November. The Pope, who is already visiting the UK next month, decided to make a return visit later in the Autumn, due to an overwhelming demand. 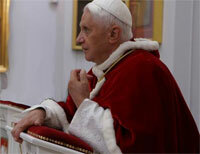 His Holiness defended his unusual choice of venue by saying, "I'm the Pope. Deal with it." He intends to stay in "Skem" for three days and make a Holy Pilgrimage to meet with The Arch Bishop of Canterbury at Costa Coffee in Bootle and have "A good pray" at a local Church. The reaction on the streets of Skelmersdale was understandably electric. "Oh my god! I can't believe it! I want him to bless all 11 of my children!" said Sonia, aged 15. Mayor Headchav, of Skelmersdale, had a more constructed opinion on the visit, "It is an honour that His Holiness has taken the time to visit our Town when you consider his busy schedule. I hope he can ignore the lack of Christianity in our town and have a thoroughly pleasurable visit." Tickets are still available for The Pope's "Get holy Quick" talk at Bootle Sports Centre, 6th November, price £10 "Other" and £5 "Christian."